In Costa Rica there are two seasons to spot the humpback whales. They migrate from their feeding areas in the North and South Americas to our warm tropical waters for mating. These whales are characterized as being very sociable, but usually travel alone or with their offspring. They are rarely found in groups, which are mostly formed by males, to compete for the females. One of the strategies the whales use during their breeding season is to stay in warm shallow waters, such as bays, because their geographic features provide better protection for their young, known as a calves. 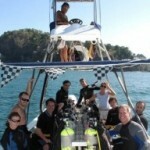 In Costa Rica we have the great Coronado Bay located in the South Pacific. This bay includes the waters of the Marino Ballena National Park, Drake Bay and Cano Island. The temperature and depth of the water around Cano Island provide some of the best conditions for reproduction and protection of the calves in their first weeks of life. This is also the area where the majority of migrating whales give birth to their young, giving it an important biological value. 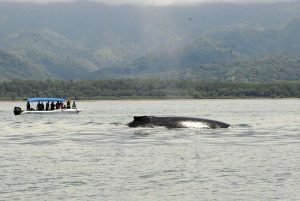 The conditions of the Coronado Bay area favor ecotourism, making it the largest in the tourism industry for the sighting of cetaceans in Costa Rica, especially for humpback whales. Three species of dolphins are seen regularly, along with the occasional visit from Bryde’s whales, pilot whales and false killer whales. During the months of June, July & August of 2013 Bahia Aventuras & Geoporter are working with students to construct trash containers made from plastic bottles used during the tours. The student groups meet every Friday, after a Whale Watching Tour at the headquarters of Bahia Aventuras to work with Cindy Thiele , Luz Mirian Badilla & Amy Work (active community collaborators & Geoporter members) and our guides Wayner and Reimer. 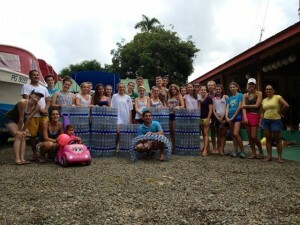 During the afternoon they create 3-4 trash containers that are composed of 458 bottles each. During this process the students have the opportunity to learn how to transform and resume trash and recyclable in order to minimize the pollution of our oceans and environment. The goal is to deliver and place these trash containers for classrooms in the schools, at the newly constructed covered bus stops andat the entrance to Mariono Ballena National Park in our community. Other projects students groups are working on are beach clean ups and painting and repairing the rangers stations and the facilities at the Marino Ballena National Park. Snorkelling at Isla de Caño – a great experience! The following is a guest post written by Chris and Anja, volunteers with Bahia Aventuras, about the Cano Island Snorkel Tour. Thanks Chris and Anja for contributing. Me and my girlfriend booked a snorkeling tour in December. We had a 1,5h long boat trip to Isla de Caño, south to the Marino Ballena National Park. The trip started right within the National Park, which turned out to be amazing: dolphins decided to accompany our boat and we even saw two humpback whales! Our guide explained everything about them and was really helpful. In total, we visited three snorkeling spots where we could explore the reefs in front of Isla de Caño. The water was quite cold that day, but we saw lots of different fish species and even a sea turtle. Our group also visited the island itself for lunch (typical costa rican arroz con pollo, pasta salad, sandwiches, fresh fruits – yummy!) and relaxing at the beach. Overall the trip was informative, well organized and is absolutely recommendable! In the beginning of 2010, me and my girlfriend decided to take a break from our jobs at home and to look for possible volunteer positions in Central America. We started by contacting several organizations and soon it was clear that Costa Rica was the country with most possibilities in this area. 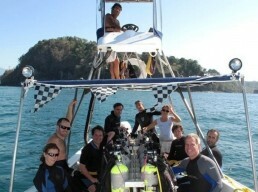 We flew to Costa Rica in November 2010, ready to start working in December. We stumbeled upon the company Bahía Aventuras on www.sustainabletrip.org And it seemed to offer everything we wanted: the possibility to work in a marine environment, a connection to a national park and interesting fields of volunteer work. Travis was very quick in answering our inquiery and soon a skype meeting was set up. The enthusiasm of Travis regarding his work and the possibilities for us made it easy to decide that we would like to join Bahía Aventuras for one month. We came to the community of Bahía in December and were able to find a nice apartement ten minutes away from our office. The first day at worked was all about introducing ourselves to the staff and making a working plan for the next four weeks. Bahía Aventuras resulted to be very cooperative and flexible – we were able to bring in our own ideas, wishes and suggestions. Finally, we agreed on the following things: our work would consist of optimizing and reprogramming the website www.bahiaaventuras.com, taking (tour) pictures for the company as well as evaluating the tours offered and defining measures to improve them. In exchange, we would be able to join the tours for free and use the surfboards of Bodhi Surf without charge. An employee of Bahía Aventuras also rented two bikes for a reasonable price for our time in Bahía. We also appreciated the possibility of using the wifi internet connection of our office for private matters. Our working week was never the same – our timetable was pretty much defined by tour schedules, wheather conditions and the quality of the internet connection. Some of the work (editing photos, writing reviews of the tours, drawing sitemaps and a guideline for website improvements) was able to be done from our appartement, everything related to website programming and staff meetings had to be done at the office. It was a good feeling to have a list of goals which we should achieve after our month of work instead of having concrete times of work. That made it possible for us to connect work and leisure time in a flexible way (Waves are good in the morning? Let’s go surfing before we head to the office!) . Travis took very good care of us – we installed a formal meeting once a week where we discussed our progress and other oportunities of working outside of the company (e.g. surf lessons for the kids of the community, GPS training, spanish lessons, taking photos of surf lessons etc.). We felt very welcome in the company and the community itself. A number of other volunteers made it easier for us to compare our experiences. We definitely made a good choice :-). All the people had a very friendly, open hearted attitude and soon we felt at home in Bahía. The small number of inhabitants made it easy to get a good feeling for the way of life in the community. Personally, we had the impression that many people are taking the pura vida lifestyle too seriously instead of life (work) itself. Explore new underwater treasures with the PADI Advanced Open Water Diver course. Step beyond the PADI Open Water Diver level and make five dives and have the opportunity to try some of diving’s most rewarding and useful specialty activites. 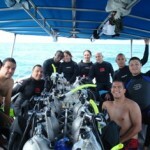 Explore such activities as deep diving, digital underwater photography, night diving and much more. This license allows you to dive anywhere in the world to a maximum depth of 30 meters/100 feet without professional supervision. Boost your confidence with your PADI Instructor alongside as you complete the deep and underwater navigation Adventure Dives. 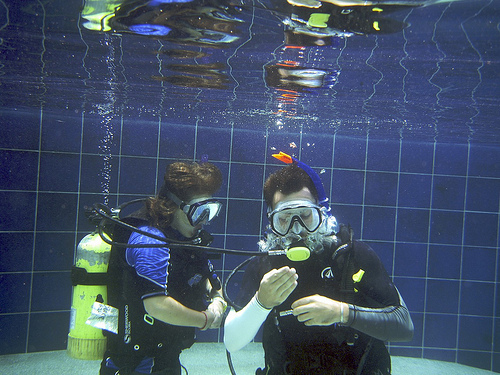 These dives build great foundational skills. Later, choose three additional dives from night diving, search and recovery, Fish ID, underwater nature study, multilevel and computer diving, peak performance buoyancy, underwater photography, enriched air amongst other adventures. Finish your PADI Open Water academic and confined water studies and training with your local dive shop and then join us in Cano Island, a warm crystal clear tropical paradise for your 4 Open Water dives. PADI Instructors will assess your knowledge and skills and then accompany you on your dives in the tropical Pacific Ocean. 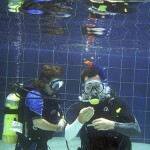 Throughout the 4 dives you will practice your skills and techniques that you mastered in the confined water. The referral option can be completed in just 2 days. Equipment rental provided: mask, fins, snorkel, tank, regulator, buoyancy compensator, submersible pressure gauge and 3mm wetsuit. Observe the beauty of what diving in Costa Rica’s tropical water has to offer without immediately committing to a certification course! Afterwards enroll in a program or certification course. 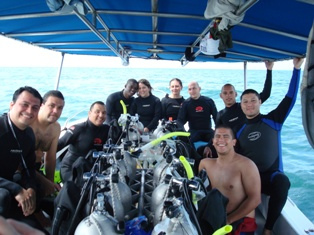 The PADI Discover Scuba Diving experience can be conducted in half-day and requires no previous diving experience. First watch a short DVD explaining dive fundamentals, techniques and theory. 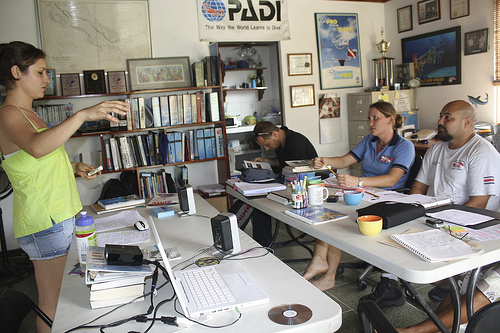 Later, review the most important points with a PADI Professional, who will answer any questions or concerns you may have. 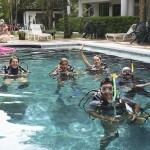 Afterwards, under the direct supervision of a PADI professional you will discover how easy it is to use scuba in a pool. Once comfortable, you will then finish the day with 2 ocean dives! Dive now and change your life! Flexible schedules to fit in with your vacation demands. 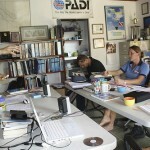 Take the PADI Scuba Diver course that requires no previous experience and earn a PADI diving certification in 2 ½ days! Dive anywhere in the world to a maximum depth of 12 metres/40 feet under the direct supervision of a PADI professional with this certification. 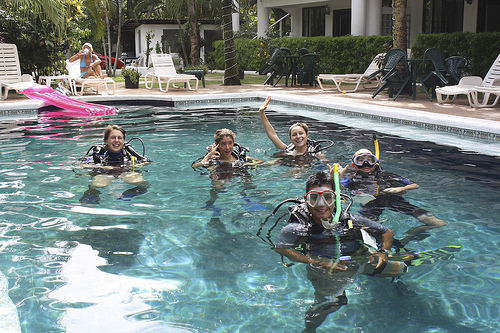 The Scuba Diver course is comprised of 3 academic modules, 3 confined water training sessions and 2 open water dives. Complete the PADI Scuba Diving Course and then you are only 1 ½ days from earning your full PADI Open Water Diver certification. Bahia Aventuras offers diving through Oceans Unlimited, the only PADI 5 Star Instructor Development Dive Resort on the central-south pacific of Costa Rica. Their mission is to provide high-quality & safe, PADI dive courses, training packages, professional courses, and dive trips. Oceans Unlimited are ECO operators and have received Project AWARE Environmental Achievement Awards for the last 4 years for their environmental work in Costa Rica. They are also approved by the Costa Rica Tourism Board. Whether you want to discover an amazing underwater world, or are looking to advance your PADI dive training, Oceans Unlimited has the best facilities and resources operating from the first class, state of the art Pez Vela marina in Quepos. They offer PADI recreational dive courses from beginner’s Discover Scuba and Open Water right through to the prestigious Master Scuba Diver. They are also a DAN Training Center and offer the full compliment of EFR courses, including EFR Instructor. With full-time profesional instructors on staff they keep class sizes small, ensuring better attention, low student to instructor ratio and personalized service, all with the goal to maintain a fun, safe, and rewarding experience that makes you a better diver!